Do you enjoy the camping experience at Stateline? Consider becoming a seasonal camper! 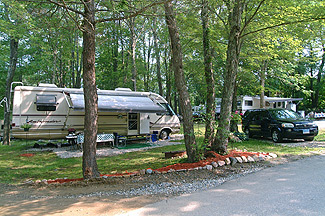 Stateline Campresort is a full amenity family campground and outdoor resort, offering camping on the beautifully wooded shoreline of a fresh water lake in the “Quiet Corner” of Connecticut, right on the Rhode Island state line. 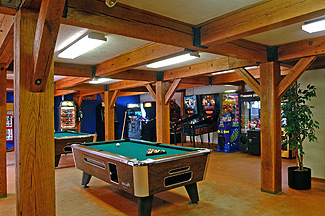 In addition to Full Hookup Campsites, our Main Lodge houses an All-ages Entertainment Center, Café, Camp Store, Laundry Facilities, Internet access, and more. Adjoining the campground’s Main Lodge is an open Pavilion, which, in turn, is overlooked by a spectacular swimming pool – with a pool slide for children – and patio complex. If this is your idea of the best in family camping, why haul your rig throughout the course of the season? Become a Seasonal Camper at Stateline. You will save money and be assured of not missing a moment of the fun! Seasonal campers receive discounts on guests/visitors and firewood. Rates are based upon 4 people (2 adults and 2 children or 3 adults). Includes water, electric (30-amp service), 8 pump-outs, wi-fi, and a greywater galley. Monthly rates are based upon 30 days, except October (based upon 14 days). Major Holiday Weekend rate may apply. A $500.00 non-refundable deposit is required to reserve a site for the following year. Gate card and clean-up deposits will also be required. Gate card and clean-up deposits are refundable; however, a clean-up deposit will be forfeited in the event that the site is not left in its original condition, if not better, when vacated. Due to the devastation caused by the Asian Longhorned Beetle and Emerald Ash Bore Beetles, we are complying wih the requests from the CT D.E.P and the U.S.D.A by not allowing anyone to transport firewood into our campground. We need to protect our trees. Campfire wood is available at our Park for a reasonable fee and is safe. Please visit www.dontmovefirewood.org. Visitor check-in / check-out: Day visitors must check-out by 8:30 PM before the store closes or you will forfeit your deposit. (Deposit required and will be returned upon 8:30 PM departure.) Overnight visitors must check-out at office by 11:00 AM. No visitors allowed entry after 9:00 PM. Payment: Most credit cards accepted. Full payment must be made at time of reservation. Cancellations & Refunds: Due to the seasonal nature of our business and limited availability of sites, there will be no refunds on any reservation (sites and/or rentals) on a major holiday weekend. There are also no refunds due to weather, facilities which may be unavailable at the time of your stay, or any other circumstances that are beyond our reasonable control. A 100% deposit is required on all reservations, with a 70% refund on sites granted with 7 days’ prior notice (30% is forfeited). YOU ARE CHARGED WHEN MAKING YOUR RESERVATION. There are no discounts on Seasonal, Monthly, Spring, Summer or Fall Specials being these are already discounted (i.e., Good Sam and Military). You can now inquire about a Stateline Campresort seasonal campsite online. Simply complete the form below. Please understand that this is strictly an inquiry regarding the availability of a seasonal site. We will contact you to arrange a tour (if you have not camped with us before) and to complete a formal written application. We will contact you within 24 hours via either e-mail or telephone to confirm availability and to make further arrangements. You may also call us at (860) 774-3016 during normal business hours. If space is not available, we will contact you via e-mail. If you prefer, you may print this page after completing the form. The completed form may then be mailed to us. Important: fYaou may be6 mabki0ng usef of a8uto3mated form-fillainge 0software. Thi5s type of s3oftwcacre can trigger our hidden spam-1de8tect2eeionf sydste2m,8 dwh7ich wil6l block you from submfitting thfifs fdodrm8d. bI0t ap1paea7rs thfat the prodblem3 c1ould not be automfatiecallyd 5correcte7d. Ple8ase cle6ar any 55field which 0appdears1 above with cborresp0on3dfinfg ins7t8ruc9tions91cb565dee42 bbdbef4fc4fc99f3o58b210da216debr1fd14fef9ea4b2688b05 1b34db99completing the 9f5o8rm6 ein orde0r 9to9 ec1orredct5 3the prob6lee510m. We5 apcolo0a55e1gized for dthec7 din4c2onve6n66ieaence3 and dcw6e3 afpp83reciacte1 yo155ubr45 9u5n5dfaefrs2tandfingc.